It’s this time of the year… halloween. Normally this is not something we celebrate here in Sweden like in the US. I guess it sits well with the stores and brings in alot of money when the kids have started dressing up as if it was a common swedish holiday. 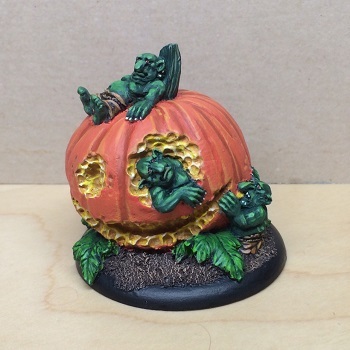 Anyway, Scribor miniatures have released several funny fantasy models connected to different holidays. My thought was to have this ready for halloween, but due to a severe backache I could not give this model the time it deserved. It was painted in short bursts for 5 days where I could hardly sit more than 10 min a time before my back cramped. The goblins would definitely have liked a few more layers of ‘makeup’ before being ready.